Part of the latest season by Welsh National Opera (WNO) is a new production and opera that moves on the story of barber Figaro in Figaro Gets A Divorce. 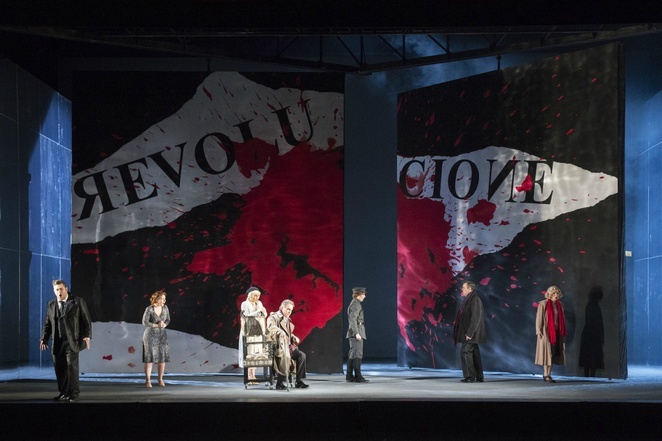 If you ever wondered what happened to the engaging Sevillian barber following his enterprises with Rossini and his marriage as fêted by Mozart, then Welsh National Opera may have your answer. Playwright Beaumarchais supplied the original final instalment of Figaro's biography in La Mère coupable (The Guilty Mother); then along came Horvárth in 1936 with Figaro läßt sich scheiden (Figaro Gets a Divorce). Now WNO's Artistic Director David Pountney has penned his own 21st century version, combining bits from the French polymath and the Austro-Hungarian dramatist, merging them with his own individualistic reading. Together with composer Elena Langer and the WNO production team, they have created a compelling piece of musical theatre – Figaro Gets a Divorce. Themed seasons are becoming a habit with Pountney and WNO and this Spring sees The Barber of Seville and The Marriage of Figaro grouped under the label Figaro Forever. With such a flamboyant character as this fixer-factotum, it's an inspired model, although taking in the operas in three successive evenings as their tour-schedule demands, is a somewhat taxing programme. Each composition does stand-alone, but full appreciation of the Pountney-Langer interpretation benefits greatly with knowledge of the previous Figaro storylines. I caught up with its first tour outing at Birmingham Hippodrome on March 3. Pountney also directs his creation, setting it amidst an unspecified twentieth century revolution. 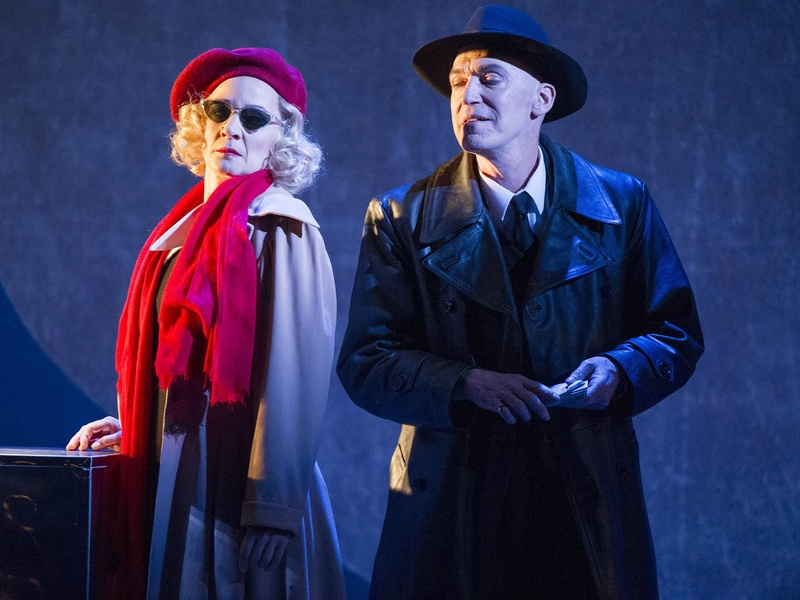 Essentially dark, there are lighter moments, like after the Major denounces the Almaviva clan to the authorities they take flight for the second time, forming themselves into a piston-moving train complete with Vettriano umbrellas – but this is hardly side-splitting. Much of the prevailing starkness comes from the designs of the amazing 91 years-young Ralph Koltai, his panels (softly lit by Linus Fellbom) seamlessly creating, dividing or confining the stage space in sympathy with both character reflection and narrative consequence. Impressionistic images were rife – from the initial cleft-in-heart shape that served as prologue, to the oppressive Soviet-style propaganda billboards. Backdrops complimented shifts in locality: a castle (once the Almaviva home, later an asylum), a bleak mountain border, a comfy hotel and some sparse lodgings, a night club and a barber's salon. Sue Blane's costumes complemented too, for example, the Countess now no longer a well-to-do aristocrat, is dowdy yet surprisingly still hanging on to her class issues of two centuries past with her domestic Susanna. However, Figaro's wife, having gone off with The Cherub (Cherubino didn't die in battle) and become pregnant, her wardrobe becomes bedraggled, reduced to slaving over an ironing board. With so much toing and froing in overcoats that other props inevitably include suitcases. Whatever the situation, Langer's eclectic and predominantly tonal music matches mood. Although written for the same orchestral instruments as the Mozart forerunner, the full complement rarely combine and when they do (such as when the Countess stands up to the Major) the WNO orchestra, under conductor Justin Brown, enhance the drama, producing some tense and sumptuously energetic sounds. Three key instrumental additions stood out for me. The flexatone plus other high pitched percussion create an atmospherically bright sound, such as to accompany the opening flight of the émigrés. Then there's the shrill of the train whistle which backs up the bolting Almavivas' escape from the establishment; and finally the accordion of Karen Street contributes a jazzy rhythm to the cabaret number. The lower strings also figure sonorously at tender moments, while the piano adds warmth to the finale. Vocal lines are colourful too, although not every syllable is crystal but surtitles fill in the gaps. WNO field a strong team of singers and taking the deserved final bow at curtain call is Marie Arnet, superbly characterising the evolving dispositions of Susanna - unfulfilled motherhood, racy floorshow entertainer, harassed skivvy and convincing reconciler. Figaro's collapse in self-esteem is well handled by David Stout while Mark Stone as the Count inverts from toff to contemptible having gambled the remains of his money away. Elizabeth Watts does brilliantly as the Countess, first radiating despondency in 'How much further can we fall?'. The closing duet of Watts and Stone, following their joint decision to stay and 'face the music' together with their 'Goodbyes' to the family, provides an exquisite finale. A latter-day Basilio, The Major of Alan Oke treats his captives with disdain as his 'Racketeering Song' proves, but despite a degree of creepiness as the Revolutionary Inspector, I thought his part demanded more menace. Countertenor Andrew Watts as The Cherub accomplishes a convincing transvestite change from hostess (of his bar with its clever slogan Mi fa palpitar, another aria reference to Mozart) to womaniser to cynic, with aplomb. Serafin (Naomi O'Connell) and Angelika (Rhian Lois) delightfully sing the obligatory operatic love duet 'My little sweeting' while the sextets of the whole family show how Rossini's application of this ensemble mode can be updated. But, despite the title, Figaro does not get a divorce as he and Susanna soldier on along with the second generation Almavivas and Susanna's unborn child. Figaro Gets A Divorce continues to tour the UK until April 7. Details at https://www.wno.org.uk/divorce.